Honey garlic chicken thighs with roasted broccoli. A sweet and sticky sheet pan dinner that rivals any takeout order! As someone who feigns vegetarianism in most social situations unless barbecue is involved, my weakness is chicken thighs. Especially these honey garlic chicken thighs. It’s not often, but I get a craving for crispy fried chicken coated in a sweet and sticky honey garlic sauce about once a month. One of my favorite bloggers, Mel from Mel’s Kitchen Cafe taught me how to dip chicken in cornstarch and eggs before frying it in her famous sweet and sour chicken recipe. It’s been my go-to method for frying chicken thighs ever since. Dipping chicken in cornstarch and eggs creates a crispy crust that begs for a sweet sticky sauce. Plus, I love that cornstarch sticks to the protein better than flour typically does. If you’re afraid of frying, I have a ‘I believe I can fry’ manifesto on my Chicken Schnitzel recipe. Frying is something that you have to practice. For some reason, the first time anyone golfs, they assume they’re going to be terrible. But the first time someone follows a recipe and tries a new cooking method, they assume they should get perfect results. It kinda kills me. Becoming a good cook takes practice. It’s delicious practice and you get to eat along the way, so join me! I love that this is a sheet pan dinner, aside from frying the chicken before it hits the pan, of course. After I’ve fried the chicken, it’s so convenient to make the broccoli side dish on the same roasting pan. Plus, roasted broccoli is seriously delicious. If you don’t think you’re a broccoli lover, you have to try it roasted until it has toasty edges. Is this dish really garlicky? No, not really. The garlic mellows as it cooks in the oven, and provides a savory, rich flavor. It doesn’t have a raw garlic bite to it. Do I really have to fry the chicken before baking it? Yes, but it’s so easy! I even made you a how-to video. You can use a bigger skillet than me so it takes much less time. Will this recipe for honey garlic chicken thighs make me never want to order takeout again? Yes, most definitely. It’s so easy to make your favorite takeout dishes at home. If you need any more help with this recipe, check the HOW TO video for it at the top of the post if you’re on mobile. If you’re on Desktop, the video usually jumps to the side of the page and plays after a short ad. And feel free to leave a comment below, and I’ll get back to you! Honey garlic chicken thighs with roasted broccoli. 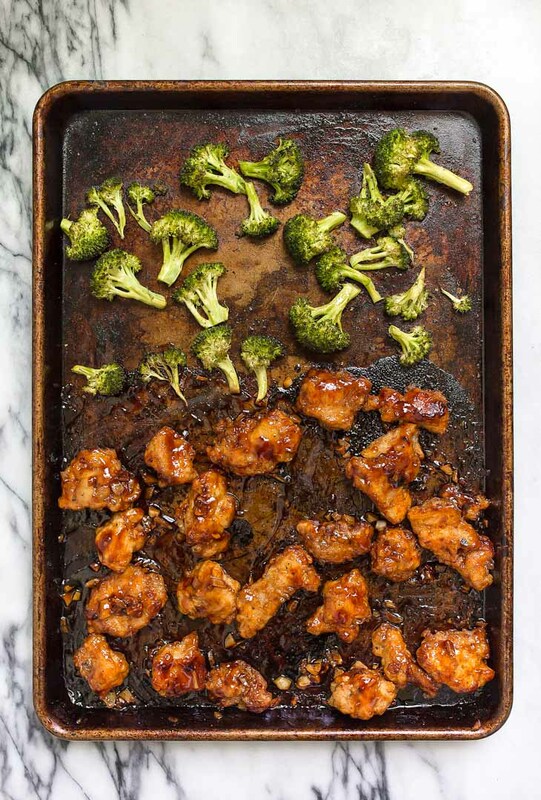 A sweet and sticky chicken sheet pan dinner that rivals any takeout order! Preheat the oven to 375. Spray a large baking sheet with cooking spray, and set aside. In a small bowl whisk together the garlic, honey, soy sauce and ketchup. Set aside. Next, using kitchen shears, cut each chicken thigh into 5 or 6 bite-size pieces. Add the chicken to a large resealable plastic bag. To the bag of chicken, sprinkle in the 1/2 teaspoon of salt, 1/4 teaspoon pepper, and 1/2 cup of cornstarch. Close the bag and shake the chicken to coat it with the mixture. Meanwhile, in a non-stick skillet, heat the oil until it's very hot and almost rippling. Have the beaten egg ready in a shallow dish nearby. Remove each piece of chicken from the bag, dunk it in the beaten egg, and then place it in the oil to fry. Fry until the crust is lightly golden (it will feel crispy with your tongs), flip and fry on the other side, too. The chicken won't be done completely, but it will have a nice crispy coating. It might take 2 batches to fry all of the chicken, depending on the size of your skillet. Place all of the chicken on the prepared baking sheet, and push it to one side. Pour the honey garlic sauce over the chicken, and use a spoon to toss it to coat. Spread the broccoli florets on the other side of the pan, drizzle with extra oil, salt and pepper, and toss. Bake the pan for 15 minutes. When the chicken is done, stir it again to coat it in the sticky sauce. Serve the chicken with the roasted broccoli and cooked rice. The simple ingredients and method tells me this is going to be a rotation meal.. The video confirms that..
What a great recipe. Can’t wait to make it. Are you looking on desktop or mobile? If you’re on Desktop, the video goes to the side of the page, at the top of the side bar. If you’re on mobile, it’s right at the top. Let me know if you need any more help. Where’d you get that bowl? I need good dish registry and those are LOVELY! They’re Crate & Barrel! I love them so much! Do you think this would work with beef? Yes, as long as it’s appropriately prepared. The larger the portion of meat, the more you must ensure it is thoroughly cooked thru. This works for chicken, beef, or pork. Holy Cow!! This recipe was fantastic! I doubled it so I could share with my neighbors. Thank you so very much for this wonderful dish!! Any chance it would work with chicken breasts? Can this be air fried? Christina – I did try the recipe using my air fryer for the chicken. It was ok – would have been better doing it your way. However, so delicious!! My husband was skeptical when he saw what was for dinner but ended up talking about how great it was. The sauce made the batter soggy . It probably would be crispy if the sauce was added after baking the chicken ? Hi Roy, it’s not supposed to be super crispy…it’s supposed to be a thick coating with a thick flavorful sauce…but yes, go ahead and add the sauce after if you wish, but maybe boil it on the stove first to thicken it? I made this following the instructions and it was fantastic! The entire family loved it. Do you know how rare that is?? This is going to the top of our regular dinner rotation. Thank you!! Hi, I was wondering if I could use whole chicken thighs? Like, with the bone in? On the baking pan can I mix the chicken and broccoli together to get the sauce onto the broccoli as well? I just made this for my family of six! They loved it! I doubled the recipe and there was just enough for my husband’s lunch the next day. 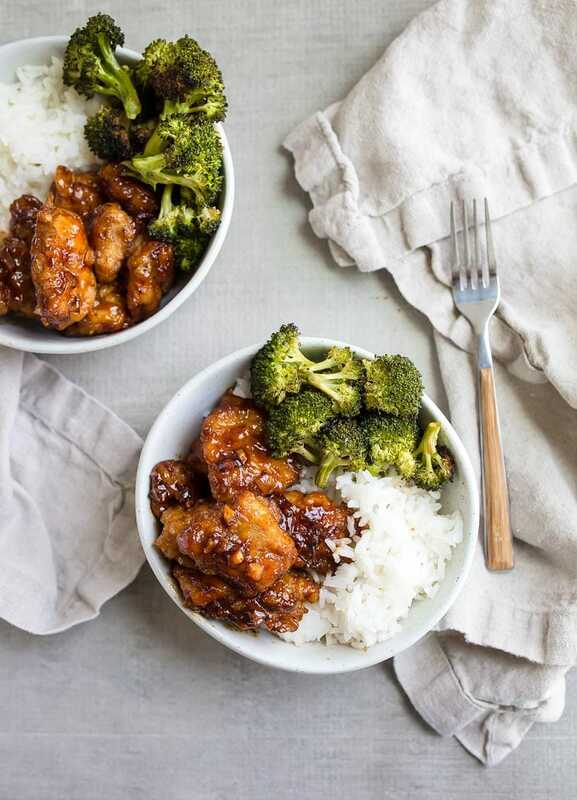 My only suggestion is I will double the honey garlic sauce for a little extra over the rice and broccoli. I just made this for dinner, didn’t have ketchup, so I used about half as much tomato paste. Woah man. This was delicious. My wife and I are putting this one into rotation. Thanks a ton for this recipe! Made this for dinner last night and it turned out great! Super easy and delicious. Will definitely make this again! Delicious! Such a wonderful recipe. Great recipe. My husband says it tastes like restaurant made. 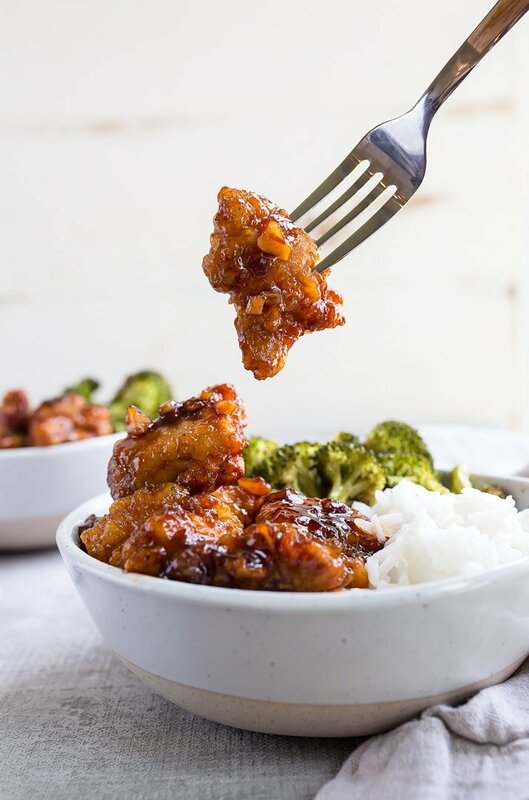 Can I use this recipe for honey garlic chicken wing? Oh my goodness this dish is wonderful and as good as take out Chinese food. My children and husband love it!! I added ginger root and sesame oil to the mixture, poured it over the chicken and baked. Once the chicken was cooked thoroughly I added extra honey over the chicken and stirred it all together with the broccoli right before I plated the dish. Thanks So Much!! I love love love this recipe and my Fiancée does as well. I made this dish twice this week. Thank you so much for sharing. It’s dedinitely a hit. I came home from shopping at 6:34 and we need to leave at 7:45 for an event, so I told my partner “dinner should be ready in 30 minutes.” Honestly I have to factor in putting groceries away to find some of the ingredients I just bought, but this will be coming out of the oven in about five minutes which puts us at 7:19. Not bad. I obviously haven’t tasted it yet, but it reminded me of General Tso’s chicken, so I added a few red pepper flakes to the sauce. I’m sure it will be delicious—but I’m even more impressed at how quick this was! I’ve spent hours trying to make the famous Chinese restaurant dish, and it never comes out anywhere near like restaurant style. This looks fantastic! Thank you! I made this on Saturday evening for my husband and myself, it was a huge hit and will become part of our regular rotation. I prepared it exactly as the recipe was written, and I admit I was skeptical about dredging in the egg AFTER coating with the corn starch, but I was wrong. The chicken fried up beautifully! 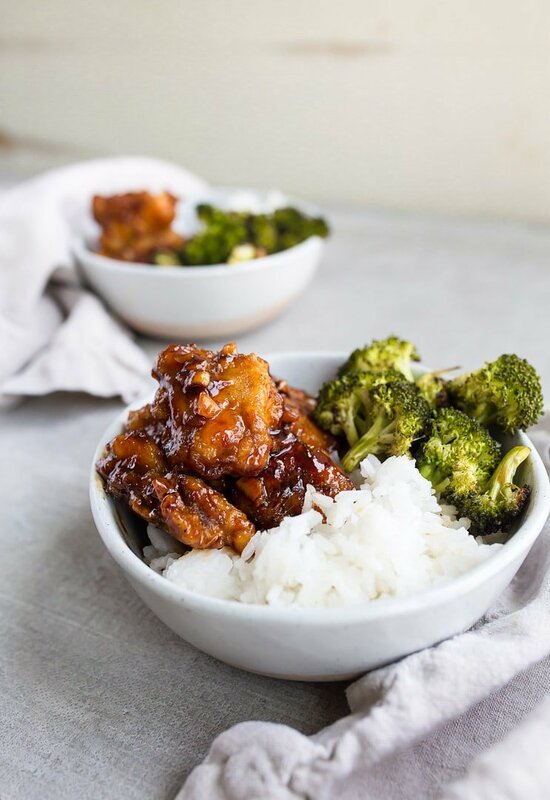 My husband isn’t a huge fan of Chinese food (or garlic for that matter), but I went out on a limb because this recipe really appealed to me…loving these sheet pan meals! The one point we both agreed on is that we would have liked a little bit more of the sauce for the rice. I’ll double the sauce mix next time and perhaps simmer half on the stovetop for drizzling over the rice. BTW, I used the Minute brand of Jasmine rice and I highly recommend it, it cooked up so fluffy and fragrant. And next time I will experiment with leaving the boneless and skinless thighs whole, rather than cutting them into chunks, it’ll cut down on the prep time. I really think thighs work better in this recipe, I think using boneless breasts would result in a dry, tough chicken. And chicken thighs are more economical too…win/win! Thanks for another great recipe! Christina, Just made it for dinner. I did use boneless skinless chicken breast, I loved it, it turned out great! Very easy definitely a keeping! Would this work with shrimp instead of chicken thighs? Debbie, it’s awesome! I cannot wait to try this. I bet it makes the house smell divine and tastes incredible! Made recipe tonight for dinner. Family loved it! All ingredients I had at home. I was worries about the frying part but it was Very easy to make. Will be a keeper recipe. Thank you for sharing. This recipe is AMAZING!!! I tried it tonight for my family of 5. I increased the ingredients of the sauce by 2. I did 4 and 4 and it was great! Even my 3 year old enjoyed it and he doesn’t usually care much for meat. Unless its “saucy” as he calls it. My older 2 love chicken so I’ve been looking for different ways to spin it just so we are not eating the same thing over and over. Husband calls it a “Hit” so all in all I’m satisfied. I even looooove it! Thank you! I’m subscribing! Thank you! This chicken is one of my very favorite. Your recipe here came out looking fantastic! Just got done making this and was very happy how it turned out! I followed the recipe exactly as written and will be making it again. My husband loved it. I’ve cooked this recipe and fell in love. 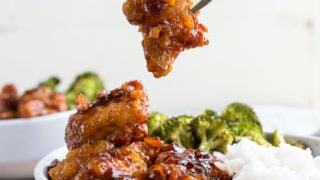 I’ve shared it with my mother and older brother as well as over time, I took a little liberty and substituted my favorite teriyaki sauce for the soy sauce and see how versatile this recipe can be with sauces. 5 stars if you can follow directions.